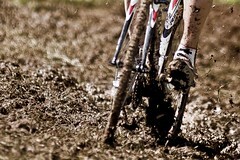 June 3, 2011 (Louisville, Ky.) – The eligibility guidelines for participation in the 2012 UCI Masters Cyclo-cross World Championships, scheduled for Jan. 12-15 in Louisville, Ky., have been announced. Rider must be of cyclo-cross racing age of 30 or older. Riders who appear in the UCI cyclo-cross rankings or have earned UCI points in the 2011-2012 season are ineligible for the Masters World Championships. Riders who participated in the UCI Elite Cyclo-cross World Championships, Continental Cyclo-cross Championships or any UCI Cyclo-cross World Cup during the 2011-2012 season are ineligible to compete at Masters Worlds. Any rider who has been a member, during the 2011-2012 season, of a team registered with the UCI in any discipline is ineligible for the Masters World Championships. There will be no ability category restrictions in order for riders to compete. All racers will be required to hold a 2012 International Racing license. For U.S.-based Masters age racers unaccustomed to this requirement, USA Cycling recommends beginning the application process as soon as the 2012 licenses will be available for purchase on December 1, 2011. The international license allows riders to compete in domestic road, mountain bike, cyclo-cross and track events; therefore riders will not need to purchase a separate domestic license for the 2012 season. The UCI Masters Cyclo-cross World Championships have a UCI-mandated field limit of 80 riders. For fields with greater than 80 registrants the UCI Cyclo-cross Commission has determined that short heats will be installed, with a limit of 60-70 riders per heat and a maximum of eight heats, and a ‘repechage’. Start order for the World Championship final will be according to the results of the heats. 3) For the World Championship Final, riders will be called up by their order of finish in their heats (all first riders of the different heats, all second riders of the different heats and so forth). 4) A second final – or Consolation Final – will be raced to determine finishing places 81-onward.